Figure 3 . Modeled compacted deep-sea carbonate thickness for key time slices in Figure 1A. Subduction zones (black hatched lines), other plate boundaries (black lines), pure carbonate platforms from Kiessling et al. (2003) (magenta), and paleocoastlines (white outlines) on continents (gray) are shown. Cool-water carbonates are not included. Reconstructions from Müller et al. (2016). Abbreviations: JFR—Juan de Fuca Ridge, CR—Cocos Ridge, ChR—Chile Ridge. Mollweide projection. Citation: Dutkiewicz, Adriana & Müller, Dietmar & Cannon, John & Vaughan, Sioned & Zahirovic, Sabin. (2018). Sequestration and subduction of deep-sea carbonate in the global ocean since the Early Cretaceous. Geology. 10.1130/G45424.1. Deep-sea carbonate represents Earth’s largest carbon sink and one of the least-known components of the long-term carbon cycle that is intimately linked to climate. 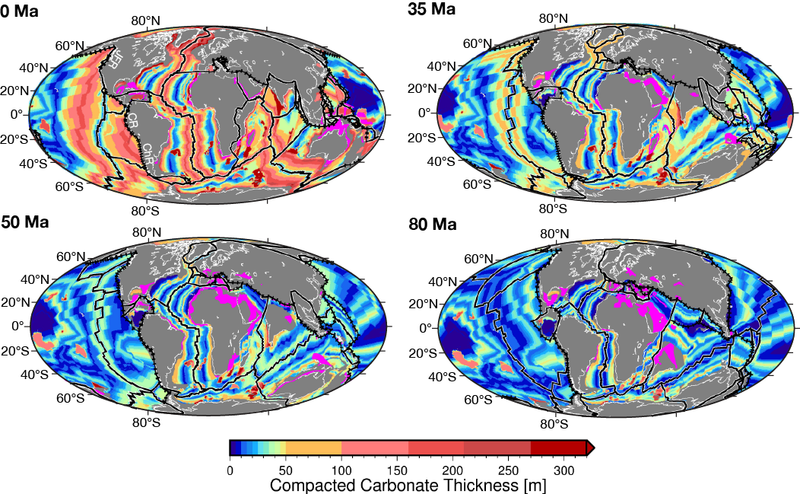 By coupling the deep-sea carbonate sedimentation history to a global tectonic model, we quantify this component within the framework of a continuously evolving seafloor. A long-term increase in marine carbonate carbon flux since the mid-Cretaceous is dominated by a post-50 Ma doubling of carbonate accumulation to ∼310 Mt C/yr at present-day. This increase was caused largely by the immense growth in deep-sea carbonate carbon storage, post-dating the end of the Early Eocene Climate Optimum. We suggest that a combination of a retreat of epicontinental seas, underpinned by long-term deepening of the seafloor, the inception of major Himalayan river systems, and the weathering of the Deccan Traps drove enhanced delivery of Ca2+ and HCO3–into the oceans and atmospheric CO2 drawdown in the 15 m.y. prior to the onset of glaciation at ca. 35 Ma. Relatively stagnant mid-ocean ridge, rift- and subduction-related degassing during this period support our contention that continental silicate weathering, rather than a major decrease in CO2 degassing, may have triggered an increase in marine carbonate accumulation and long-term Eocene global cooling. Our results provide new constraints for global carbon cycle models, and may improve our understanding of carbonate subduction-related metamorphism, mineralization and isotopic signatures of degassing. Digital resources related to the paper are available to be downloaded from here.